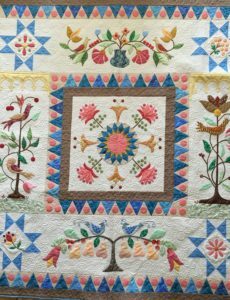 A beginning or refresher hand-appliqué class geared toward those who would like to learn hand appliqué or those who have done some appliqué but would like to hone their skills, taught by appliqué expert Sandy Reynolds. We will make a lovely quilt that will have both hand appliqué and machine-pieced blocks. In the class we will learn how to do needle turn appliqué, making perfect points, circles, and valleys. A gorgeous finished quilt is hanging in the classroom if you want to take a peak. This is a six-month class, meeting on the first Thursday of the month. Cost and registration: Call the shop to register. The class costs $30 per session. The class is to be paid for in 3-month increments. To secure your spot, $15 is due at registration. This amount covers the shop fee for the first three months; $75 is due to the instructor on the first day of class.